Since 1983, Deer Crossing has maintained a consistently high safety record due to training and awareness. 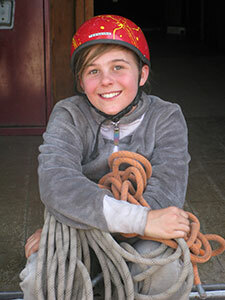 Instructors exceed the American Camp Association requirements for safety training. They are certified in Standard as well as Wilderness First Aid, including Professional Rescuers CPR. Some staff arrive already certified as Wilderness First Responders (WFRs) or Emergency Medical Technicians (EMTs). While many camps have only a few lifeguards on staff, most of our staff are certified American Red Cross Lifeguards with advanced waterfront training. In addition to the regular training, we conduct hands-on safety scenario training for all instructional staff. It’s not just our instructors who are concerned about safety. In our core program, first-time campers learn artificial respiration, canoe rescues, and other wilderness safety skills. Working with both staff and campers results in a safety awareness that filters through all our programs. As part of all activities—from archery to climbing, waters sports to campfire, and rafting to day hikes—campers are taught the safety procedures and techniques to ensure their own and others’ safety. A hospital with ambulance service is just an hour’s drive away. Emergency helicopter service is available from the Pollock Pines and Lake Tahoe areas to a nearby landing pad. Deer Crossing maintains satellite phones and satellite Internet service for emergencies. We also have ongoing relationships with the El Dorado County Sheriff, County Health Department, State of California’s Fire Department (CalFire), and the two nearest school districts for assistance in case of emergency or evacuation order.